Admiral Graf Spee — German premium Tier VI cruiser. Admiral Graf Spee belonged to a class of unique ships that combined the features of both a battleship and a cruiser. The German Navy officially classified her as a cruiser. Armed with 283mm main guns, the ship was superior to any light or heavy cruiser of her time and was only slightly inferior to them in terms of speed. Admiral Graf Spee was first released for sale on 22 December 2016 for the NA server and 23 December 2016 for the EU server. Admiral Graf Spee is a premium Tier VI German cruiser that straddles the line with battleships in several ways. Most notably, her main battery is comprised of 283mm guns: the same caliber as Tier III battleship Nassau and Tier VII battleship Scharnhorst. With an alpha damage of 8,400 per shell and a 20 second reload time, the guns perform exceptionally well against lightly-armored enemy units. As a cruiser, her version of the 283mm guns seem to have much tighter dispersion patterns than Scharnhorst, rewarding accurate shell placement; unfortunately, with only six barrels total, bad dispersion can still ruin what would appear to be a well-aimed salvo. Her other battleship-like characteristic is her access to the Repair Party ( ) consumable, normally reserved for Tier IX and X cruisers. Spee will need the extra health, as her maneuverability is far below most cruisers (but still better than many battleships). Like other Tier VI cruisers, she receives the option of equipping either Defensive AA Fire ( ) or Hydroacoustic Search ( ). Spee’s last major unique characteristic is her torpedoes. Unlike the rest of the German cruiser line — and the German battleships with them — Admiral Graf Spee’s torpedoes have a range of 8.0 km instead of 6.0 km, allowing captains to surprise enemies who may believe they are safely outside her torpedo range and providing a bit more flexibility in their use. While Admiral Graf Spee is big and bulky, she is armored in a similar fashion to the rest of her cruiser classmates; she takes lots of damage and mistakes in positioning her will be quickly punished. Spee is not a ship for the un-skilled, but is a powerful tool in the hands of players who know how to minimize their exposure enemy fire and mitigate incoming damage. Largest guns of any Tier VI cruiser with high penetration and alpha damage. Only two turrets of three guns, which means getting all guns on target can leave Spee’s broadside vulnerable to return fire. Shares the same reload time as Scharnhorst. As a premium ship, Admiral Graf Spee doesn't have any upgrades to research. The upgrade options available for Admiral Graf Spee won't radically alter how she plays, but they can be used to help shore up some of her weaker attributes. Main Armaments Modification 1 is the best fit for Upgrade Slot 1; with only two main battery turrets on a relatively slow reload, Admiral Graf Spee shares Dunkerque’s vulnerability to turret-disabling hits. Damage Control System Modification 1 should be plugged into Upgrade Slot 2, while Steering Gears Modification 2 is recommended in Upgrade Slot 4 to improve her handling characteristics. This leaves only Upgrade Slot 3, which offers some intriguing options. Particularly daring cruiser captains might wish to equip Secondary Battery Modification 2 ( ); coupled with the German Hydroacoustic Search ( ), this would allow them to aggressively close with enemy cruisers and destroyers. It's a risky tactic given her relatively light armor scheme, but might pay off in certain situations given Admiral Graf Spee’s healthy secondary armament. Either Aiming Systems Modification 1 or AA Guns Modification 1 ( ) are safer bets, offering small but notable buffs to her dispersion and anti-aircraft bubble, respectively. Captains are recommended to choose what they feel will best fit their play style for the ship. A ship of Admiral Graf Spee’s size is going to find herself under quite a bit of incoming fire, making both Damage Control Party II ( ) and Repair Party II ( ) worthwhile investments in credits (or doubloons). The choice between Defensive AA Fire ( ) and Hydroacoustic Search ( ) is not an easy one; the former offers high resistance to aerial assault, while the latter provides large periods of time where Admiral Graf Spee would be effectively immune to long-range torpedo strikes. Given her size and handling characteristics, both are good options; captains will have to make this choice for themselves based on which they fear more: carriers or destroyers. As a premium ship, Admiral Graf Spee comes included with Type 10 camouflage that lowers her detection radius, reduces the accuracy of incoming shells, and increases the amount of experience she earns. Admiral Graf Spee is a tad on the slow side for a cruiser; this can be helped by equipping Sierra Mike ( ) to bump her top speed to 29.9 knots. Other flags worth considering are: Mike Yankee Soxisix ( ) for captains who went with a secondary battery build; India Delta ( ) to get the most out of her Repair Party ( ); November Foxtrot ( ) to improve the cooldown times on her various consumables; and India Yankee ( ) to further increase her survivability. Admiral Graf Spee prepares for deployment to "North". Admiral Graf Spee citadels an enemy Shchors class cruiser. Admiral Graf Spee runs down an enemy Fuso class battleship. Admiral Graf Spee penetrates an enemy Myoko-class cruiser. Flag of Graf Spee. 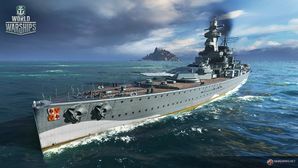 Given to players who purchased a special bundle containing Admiral Graf Spee. At 05:52 on 13 December 1939, lookouts onboard Graf Spee spotted two tall masts on the horizon. By 06:00, Kapitän zur See Hans Langsdorff's crew identified one of the ships as HMS Exeter, and decided to attack. Graf Spee’s engines were pushed to full speed, creating a towering pillar of clearly visible black smoke, and the three cruisers saw her position. The battle truly begun at 06:17 when Graf Spee fired her first salvo on Exeter, hitting home amidships and dealing significant damage to the ship's wheelhouse and killing all but 3 officers inside. At 06:23, her third salvo hit Exeter again, killing some of the ship's torpedo crews, damaging her communications, tearing holes in the funnels and destroying searchlights and the ship's on-board Walrus aircraft. Three minutes later, Exeter suffered further severe damage when her 'B' turret took a direct hit, taking the entire turret out of action. Exeter attempted to return fire, dealing minor damage, and Admiral Graf Spee dodged a torpedo salvo fired in anger by the surviving torpedo crews on board Exeter. At this point, had she so chosen, Graf Spee could have easily dispatched the pair of already damaged light cruisers still hounding her and then set out to finish off Exeter, but KzS Langsdorff made the most crucial decision of the battle: despite Graf Spee having suffered little severe damage — the only notable damage she'd taken was a six-foot wide hole in the bow that was well above the waterline and two of her secondary guns had been knocked offline — the loss of her fuel processing equipment worried Langsdorff so greatly that he chose to break off from the battle and sail to the neutral port of Montevideo, Uruguay. Of the three ships that she engaged, only one of them was in a good enough shape to pose a threat to Graf Spee, and that was only if she scored a lucky torpedo hit. Ajax and Achilles attempted to pursue Graf Spee at a safe distance, to make sure she was going to port. However, even then Graf Spee still posed a threat, for at 10:10 Achilles drew too close to the panzerschiffe, and was nearly hit by a 283mm salvo. The occasional salvo was exchanged between the three ships as Graf Spee steamed for Montevideo for the rest of the day. Once it became clear that she was entering port, Achilles broke off and took watch over the entrance to the River Plate with Ajax, as the Battle of the River Plate drew to a close. Arado Ar 196 spotter plane is missing. Catapult fighter appears to be a Henschel Hs 123, which was actually a dive bomber and close-support attack aircraft. No float plane version of this aircraft existed. Graf Spee’s main and secondary gun turrets were actually camouflaged. Aerial view of Admiral Graf Spee at Spithead, England for the Coronation Review of King George VI, 20 May 1937; HMS Hood] and Resoultion are in the background. The open control station on Admiral Graf Spee. The armored conning tower, various periscopes, rangefinder, target designators, and ship controls are visible. Taken in February 1940. This page was last modified on 19 February 2019, at 09:51. This page has been accessed 138,642 times.